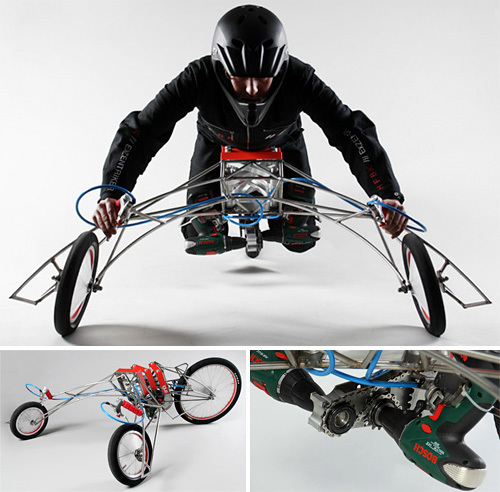 Three-Wheeled EX Trike Powered By A Couple Of Electric Drills Accelerates Up To 18+MPH | OhGizmo! The EX trike, designed and built by Nils Ferber, Sebastian Auray, Ruben Faber and Ludolf von Oldershausen, reminds me of the StreetFlyer we brought you about a month ago. Except for the fact that piloting the EX doesn’t make you look like a complete idiot. (Though there are still some compromises to your image.) With a frame inspired by a bare skeleton complete with visible organs, the EX’s drive components are mostly constructed from modified bike parts, while the frame and unique spine-shaped joint used for steering were custom-milled on a CNC machine. This looks really hard to ride. I think I will get arm cramps with this trike. lol But this looks really daring and adrenaline-pumping. This is a great ride for racing.